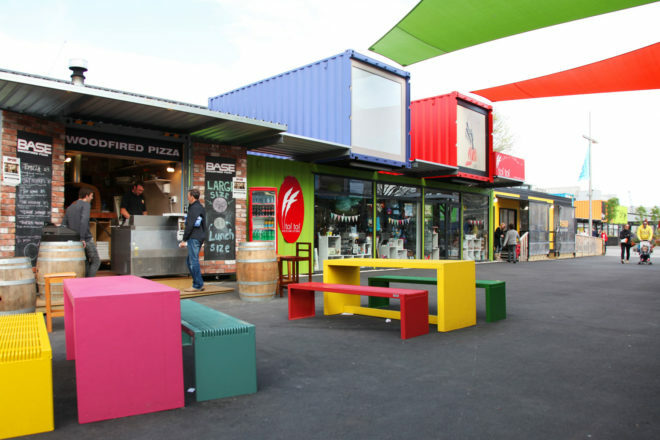 The re:START mall in Christchurch is all shipping containers. Home to the specialty retailers, like a high-end grocer, who don’t fit or work in large Westfields-like malls. Christchurch is busy reconstructing the city. But it’s in a swag of new bars and community projects that the great revival really started. Quentin Long drinks his way across a city reborn. To be in Christchurch 18 months after the shocking events of 21st February 2011, is surreal. The feelings you experience change throughout your stay. It starts with a sense of shock, guilt and a sadness that, until your arrival, you didn’t really understand just how damaged and devastated this city has been. The sight of empty office blocks, whose wire intestines remain fallen through the false ceilings and still hang like broken children’s mobiles, is enough to make your subconscious reel. And past tense is a natural state of conversation here. “That used to be my favourite [insert venue, shop or place here]” is a phrase heard far too often. But give it a day, and you’ll begin to feel amazement, admiration and humility at the mettle of these people and their city. It’s a unique time in the re-emergence of Christchurch; when “Did you see” and “Just opened” are entering the local lexicon with happy regularity. The empty blocks are no longer merely a painful reminder of what’s been lost, but an exciting opportunity for something new and surprising to be constructed. Indeed, something new opens every week here. Those cataloguing the new era of Christchurch would probably say it began around October last year: eight months after the quake, when a simple café opened in a previously unremarkable Christchurch suburb – by a guy known simply as H.
H’s story is the Christchurch story. H, real name Henare Akuhata Brown, and his wife Angelique were having a fantastic February 2011. After working their fingers to the bone opening a successful café, an upmarket cocktail bar and then a nightclub, they felt secure enough to start a family. On the 18th of February they were told that their first round of IVF was successful. It was a magic time. By February 22nd, all three premises H owned were closed forever. He and now pregnant Angelique had nothing but a heap of insurance paperwork. The buildings were either no longer standing or considered too dangerous to inhabit, so would be deconstructed – another word frequently used by Cantabrians. Bean Scene now operates on the premises of a former car wash. It’s located in one of the emerging post-quake neighbourhoods, Addington, which, along with another previously forgotten suburb Sydenham, have been re-christened ‘SoMo’ – SOuth of MOorhouse Avenue. Along with the café, H has founded a bar next door in the turning circle of the car wash. It’s this watering hole, Cargo Bar, that has really kick-started his – and Christchurch’s – recovery. “It started off as a wind barrier,” he says. “Then, after a third bottle of Pinot, my brother-in-law and I hit upon the idea of a bar. We chalked it out right then and there, with a gyprock off cut.” And so the first of a string of successful, post-quake Christchurch bars was born…. in a shipping container. H and Angelique housed their café and bar in shipping containers because they are the perfect post-disaster rebuilding block; a prefabricated bar, shop or storage unit that can be moved, aligned and combined easily. They are used so extensively across the city that they have become a symbol of ‘Christchurch reimagined’, as the marketers are branding the remaking of the city. The re:START mall is all shipping containers. Home to the specialty retailers, like a high-end grocer, who don’t fit or work in large Westfields-like malls, the colourfully-painted containers actually make for a far more interesting aesthetic and experience than the strip lighting alternative. The versatile container is also used to protect the populace from rock falls on many of the streets, particularly near the cliff faces of the eastern suburbs. In a typically Cantabrian creative community effort, many of the containers that line the drive to Sumner have been covered by huge canvas artworks. But it is Gap Filler that is perhaps the greatest example of the Christchurch community making the most of their barren spaces. The community group takes many of the empty, flat blocks that dot the city and reinvents and repurposes them for cultural pursuits. A project called Poetica saw a city-wide poetry competition held through Facebook. The winning poem is now painted on a wall. A huge mural painted on a wall reminiscent of a tool wall in a shed is poignantly called, I seem to have temporarily misplaced my sense of humour. The Gap Filler project that is by far the most popular is the alfresco dance floor, Dance-O-Mat. A response to the loss of all the places to dance in the city, the Gap Filler guys installed a stereo system housed in an old washing machine with a disco ball strung over the dance floor. Residents plug their ipod/iphone in, and with a $2 donation the music starts. Then, with the music blaring, the disco ball spinning and the city passing by Cantabrians are free to dance their cares away.